A gummy smile can really impact your level of confidence when you smile. There are a number of reasons that cause a person to have an unusually large amount of gum covering their teeth. However, now you don’t have to let the appearance of the gum impact how you feel about your smile. Gum contouring is a simple and safe procedure used to remove small amounts of gum to create a shapelier smile. Aesthetic & Family Dentistry of Washington has the facts you need to know about reshaping your gums. A smile showing an excessive amount of gum can occur for a number of reasons. Often, a more noticeable appearance of gum is caused from the abnormal eruption of the teeth. When this occurs, there can be larger than normal amounts of gum tissue covering the teeth, causing the teeth to look short. 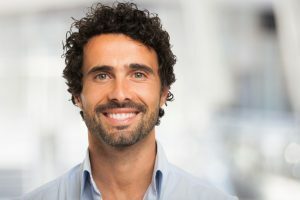 In other cases, the muscles responsible for controlling the movements of the upper lip may be overly active, causing the upper lip to lift higher than normal. This causes more gum tissue to appear when smiling. Other times, there can be an abnormality to the upper jaw bone, which may cause the upper jaw to appear bulged or protruded. The protrusion of the jaw can cause the gum tissue to be more obvious. How can Gum Contouring Help? No matter the cause of excessive gum tissue, gum contouring will create a more attractive smile. To determine the amount of tissue to be removed for a beautiful smile, your dentist will consider the size and shape of your lips. In addition, he will look at your facial muscles to determine how to best shape the appearance of your teeth by reshaping the gum tissue. During the procedure, the dentist will use specialized tools and treatments to reshape the gums, which may include the use of lasers, scalpels and radiosurgery. The method that will be used will be determined based off an individualized treatment plan for your own unique needs. A local anesthetic is used to numb the area to ensure as little discomfort as possible during the procedure. Using the best advancements in dentistry, your dentist will be able to create more precise results for a beautiful smile. The contouring is often a same-day procedure with a short recovery time. You may experience some pain, which can be resolved with over-the-counter pain medications. In addition, it’s best to eat soft foods for a few days to avoid irritating the gums. Your dentist will give you special oral hygiene tips to help brush your teeth while you heal. Gum contouring is a very successful procedure used to resolve the appearance of a gummy smile. This minimally invasive procedure poses little risks, offering the perfect solution to create a shapelier smile to give you a boost of confidence. With properly shaped gums, you’ll give your smile a makeover with a beautiful smile. At Aesthetic & Family Dentistry of Washington, we offer the contouring services you need to remove excessive gum tissue. Contact us today for a consultation.